Relax comfortably in our MADE IN AMERICA Jersey Lounge Pants. 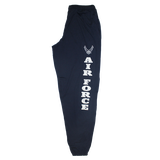 Featuring a small Air Force Hap Arnold Wing Logo and AIR FORCE text down the left leg. Elastic waist with drawstring, side slit pockets, open (non-elastic) at the bottom.